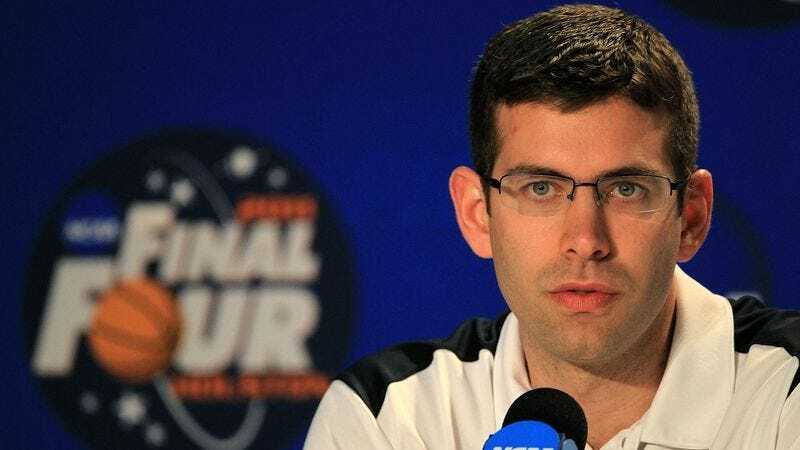 INDIANAPOLIS—Saying that Butler University "cannot afford to establish a culture of losing," Butler athletic director Barry Collier announced at a press conference Friday that the university was firing under-performing head basketball coach Brad Stevens, effective immediately. "We hired Coach Stevens anticipating that he would lead us to an NCAA title, but year after year he continues to come up short," said Collier, noting that expectations at Butler are high and that losing the finals to four-time champion Duke and three-time champion Connecticut was not acceptable. "We love Brad, and we wish him all the best, but he evidently was not the right fit for this team." Stevens, who is expected to continue his coaching career by accepting one of the many open assistant positions at the mid-major schools, was gracious, saying only that he deeply regretted his inability to match the high standard set by Butler legend Tony Hinkle, who coached the famed 1929 Bulldogs championship team.